The Past and the Pending: New Music Review: M83 - "Hurry Up, We're Dreaming"
New Music Review: M83 - "Hurry Up, We're Dreaming"
A quick glance at the overall song ratings of M83’s new album doesn’t begin to tell the story. The overwhelming 22 track album provides quite the daunting visual to the casual listener, and I’ll admit it took a few deep breaths to even begin to dive into it. Twenty-two tracks, a whole lot of soaring songs, and a heckuva lot of atmospheric instrumentals. And within those 22 tracks is a purely enjoyable, albeit challenging, album. I used this album to get me through a couple papers I’ve written for school, and it' makes good homework music. I’d get distracted every now and then by the appearance of a great track. “Steve McQueen” comes to mind, with its percussion steadily increasing until the song’s breakout. The song is immediately enthralling. Preceding this song though, is a 4 track spread of, while not technically all instrumentals, atmospheric and dreamy numbers. The overall ambiance exists, but tracks won’t lend themselves well to shuffle on your iPod. Here they exist to bolster the overall feel of the album. And thus here is an album that puts 22 tracks together, where many of the tracks don’t stand on their own, but where the overall coalescent feel of the album manages to still be outstanding. I don’t think I’d feel that way if there weren’t so many fully outstanding individual tracks spread throughout. 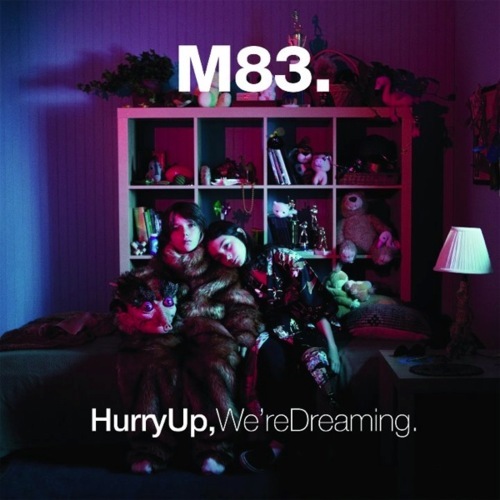 Take “Midnight City” for instance, a surefire year-end favorite, which breaks beyond the perhaps more expected shoegaze-y sound with a full force alt rocker that still stays true to M83’s sound. It’s a song I’d pay $20 to see live, even if I didn’t see anything else. Elsewhere, opening track “Intro” has a power of its own, with soaring vocals taking the place of the dreamy, distant vocals that so often are found in M83. When the third track, “Reunion”, closes, I was quite sure I’d already found my favorite M83 work to date. There are a few others worth highlighting as well. Swimming out of the atmospherics is the gentle guitar plucks and strings that begin “Soon My Friend”, along with the moving, haunting refrain of “I’ll be yours/someday” sung hopefully over an ever-increasing line of strings. There’s also the French influence (M83 hails from France), present in the amusing-and-strange-yet-somehow-alluring storytelling of “Raconte – Moi Une Historie”, which you would surely know as the “frog song” upon listening to it, and “Echoes of Mine”, told by a much older Frenchwoman. And as a closer, “Outro” is as successful as “Intro”, bookending a surprising album spectacularly. This is not an album to shuffle or to listen to in bits and pieces. It’s album meant to be consumed as a whole, and should be understood as such, more so than many albums today. “Midnight City” and “Steve McQueen” do warrant your individual attention though, and I’ve posted the former here and the latter can be listened to here. If you like them, consider giving the album a try. I had to listen to the album twice, the first time I dismissed it as too loud for my taste. I agree that it works better as a whole rather than individual tracks-particularly as quite a few tracks are short.